The debate about whether or not addiction should be classified as a disease has been a long one. Those in both camps have a sound basis for their position, with some who say that calling addiction a disease just makes it more difficult to treat as it takes away the accountability of the person addicted. The other side argues that understanding addiction as a disease makes it easier for those needing help to seek treatment because it can help to eliminate the walls of accusation and shame that are often associated with addiction. A disease is defined as “disorder of structure of function” that impairs or restricts normal functioning, often displayed by specific symptoms and signs. However you interpret addiction, all agree that the most important thing is that those who need it, seek and receive help. At the end of the day, calling addiction a disease is simply a matter of semantics. But it is clear that substance abuse can be overcome with the right combination mindset, resources, and staying the course. Those who are against the definition believe that defining addiction as a disease makes treatment more difficult. For some — even among those struggling — think that classifying addiction as a disease leaves one with a lack of accountability. Those arguing against the classification see the issue as that of personal choice. In most of the cases of addiction, a person makes a choice to start using drugs or alcohol which can lead to abuse. Some suggest that referring to those recovering from substance abuse as “patients” takes away their ownership of the problem and creates a clinical environment for treatment that doesn’t take personal responsibility for one’s role in the abuse into account. With this type of mentality, calling addiction a disease may be a misnomer. Cancer, diabetes, and other chronic disease seem to happen to people in spite of their personal choices, while addiction has a more tangible cause — drug or alcohol use. However, while cancer and diabetes may not have direct, obvious causes, it’s important to be aware of the fact, like addiction, there were factors may have contributed to their development, including genetic predisposition, environmental factors and lifestyle choices. Those who hold to this argument believe that classifying addiction as a disease can be detrimental to the treatment process for some people and can create a sense of hopelessness at the hands of a medical label. It’s helpful to recognize the various factors that can be involved in substance abuse, including emotional trauma, physical dependence and family history such as depression and post-traumatic stress disorder (PTSD). For successful long-term recovery, it’s important to fully understand the wide range of symptoms and issues that can be associated with substance abuse. Those who argue for classifying addiction as a disease believe that making this distinction make treating those struggling easier. 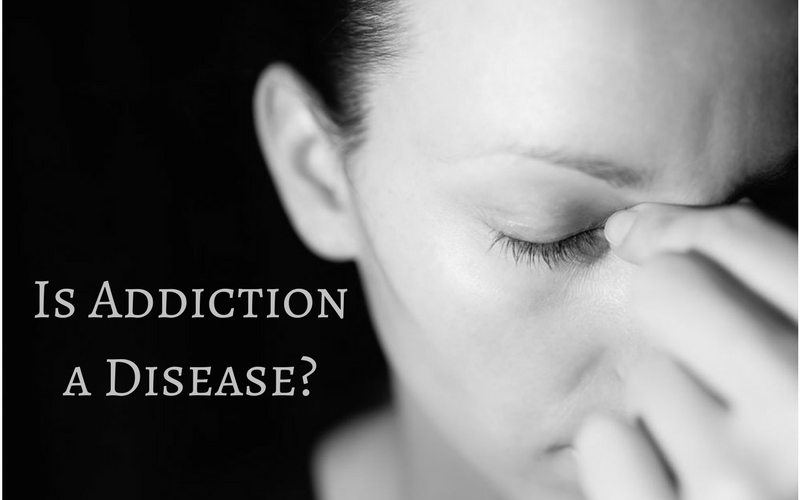 While debate continues in the medical community on whether or not addiction is a disease, many do agree that there is often a genetic predisposition for substance abuse. Couple that with the mental and physical side effects of substance abuse and addiction then meets many of the requirements for classification as a disease. Although a person may “choose” to use drugs or alcohol, becoming dependent on these substances is often beyond a person’s ability to control it. Then there are those who develop a substance abuse disorder after being prescribed opioid painkillers following a surgery or injury. There are others who have experienced a traumatic life event that elevates a social drinker into a binge drinker and beyond. While some people have no problem maintaining a balanced relationship with alcohol or other substances, some are never able to use them in moderation, either because of genetics or willpower. For many hoping to help those who struggle with abuse, looking at addiction as a disease allows the medical and lay communities to view the issue through a compassionate lens for treatment. This type of mindset can open doors to recovery for some who might otherwise be to shamed or embarrassed to seek treatment. Instead of taking away personal accountability, some argue that understanding addiction as a disease helps to motivate change, similar to a healthy lifestyle change or a prescribed medical treatment following the diagnosis of an illness. They also argue that treating addiction as a disease can highlight the medical attention that is often critical to recovery. Completing a full continuum of care, from medical detox to inpatient and outpatient programs, can help many stay on track while learning new coping methods. Because a substance abuse disorder rarely manifests on its own accord, treating it as a disease can help one to identify triggers and root causes such as co-occurring mental disorders and genetic predispositions. Drug and alcohol rehab programs help to teach people how to manage difficult life events and challenges without turning to drug substances or alcohol, thus creating a path toward long-term healing. Despite the argument of “disease or choice” among medical professionals, determining if classifying addiction as a disease makes treatment harder or easier ultimately depends on the individual. Because recovery is a personal journey, it is not a surprise that different perspectives would resonate with different people. Understanding addiction as a disease may be a motivator for treatment for some, while it may seem limiting to others. Regardless of a person’s take on it, recognizing that there is a problem and finding help to address it are the most important considerations. No matter the “disease” a person is struggling with, both sides agree on one thing: that treatment is most successful when a person takes responsibility, but also understands their family history and medical inclinations that brought it about. This in no more true than for those struggling with substance abuse.